Marshall Will Kane (Gary Cooper) has just gotten married and is about to step down from his position and leave on his honeymoon. Right before leaving, he hears word that Frank Miller (Ian MacDonald) has just been released from prison, and his gang is waiting at the train station to join him when he arrives on the 12 o'clock train. Everyone knows Miller is coming into town to get revenge on Kane for putting him in prison. Now, Kane must round up a posse to defend his town. However, Kane is having trouble finding volunteers willing to stand by him. 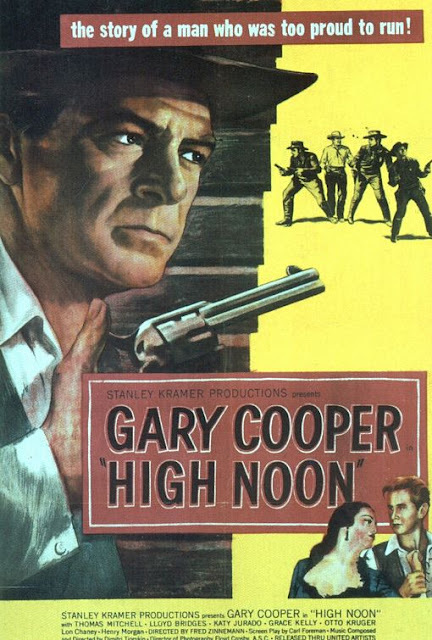 Nominated for seven Academy Awards, Fred Zinneman's "High Noon" is a classic western film starring the likes of Gary Cooper, Grace Kelley, Lloyd Bridges, Lon Chaney Jr, and many more. The story here is very simplistic, but it is just executed so brilliantly, it feels like each piece of the puzzle, each minute counts. And speaking of minutes, the film clocks in at a brief 82 minutes long, with the first 70 minutes being pure tension building to a final climactic conflict. Gary Cooper is outstanding as Marshall Will Kane in a performance which earned him a Best Actor Oscar trophy. After seeing the film for the first time, BigJ and I both agree this award was well deserved. Kane is a strong character with great depth and conviction. Upon learning Frank Miller, played by Ian MacDonald, was coming, he had the opportunity to run, but chose to stay and fight in his town. He does his best to round up a posse, but having virtually no luck getting people to join as everyone seems to have an excuse why they cannot fight alongside him. As the clock ticks ever closer to noon, Kane still lacks volunteers, we sat on the edge of our seats, waiting and wondering how it would all turn out for him. Would the town rise up to help, or leave him to face Miller and his gang on his own? The tension gets so thick, you can cut it with a knife. Kane even has trouble getting deputy Harvey Pell, played by Lloyd Bridges, to stand by him after they have a falling out over a woman. Kane's newlywed wife Amy, played by the remarkable Grace Kelley, is a devout Quaker and doesn't believe in violence of any kind. She just wants her husband to leave town and not look back so they can get on with their newly formed bond and lives. However, he knows he can't, because if he doesn't face Miller now, Kane will be looking over his shoulder for the rest of his life. This inner conflict within all the characters in this film is what makes it so compelling as a whole. "High Noon" was a relatively unknown film to us, but we are glad we took a chance on it. This film has held up well over the years and doesn't feel dated in the slightest. When compared to more a modern take on the western genre, like the recent "Jane Got a Gun," which is much longer in length with a lot less story, we can truly see how well a shorter, more concise story and film can make all the difference in the world. Westerns are period pieces to begin with, but when executed slowly, poorly, and ramblingly, they don't make for a good viewing experience. We didn't have a problem with any of this during "High Noon," finding only well written characters, fantastic cinematography, impeccable direction, and straight-to-the-point drama with no muss or fuss. It deals with themes that any generation can relate too, which might be part of its mass appeal. Cinephiles will enjoy this for the visual spectacle and acting, and casual movie watchers will be awed by its simplistic, but well executed story. One year ago, we were watching: "Anatomy of a Murder"